If you have some trouble in registering Edraw software, Please review this page. Read this page to learn how to activate your Edraw product. 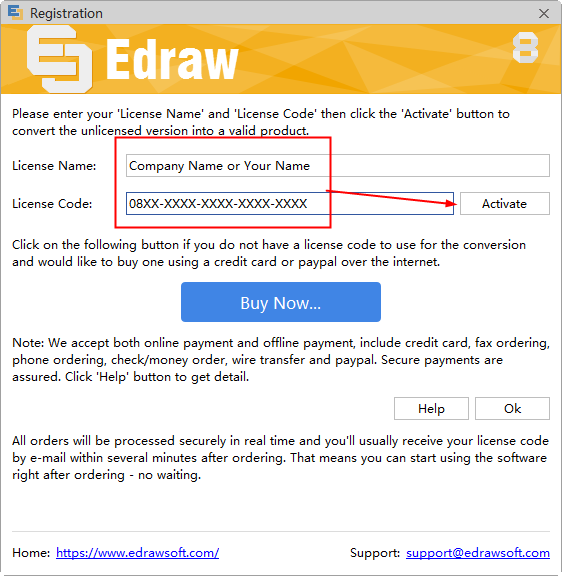 Follow these steps to activate your Edraw product with no need to uninstall or reinstall the software. Note: You must have Internet access to activate the software. After you completed the activation, the trial version will be converted to full version. The process to Register your trial software begins when you get a License Code. Follow these steps to convert the trial to the full version. 1. Obtain the Edraw product at any retailer or online retailer to get a valid License Code. You can also order online and get the Product Key from us immediately. You have two options to start the conversion process. • In any of the trial expiration reminder messages sent to you in the last 30 days of the trial period, simply click Convert. • In the Help menu of the trial product you are using, click "Register". You can do this at any time during the trial period, or even after the trial has expired. 2. In the Pop-up dialog box, fill in your "License Code", then click the "Activate" button. Note: If you choose to obtain the product online, you will be routed to the Edraw Web site and the RegNow eCommerce vendor to obtain a product key. You will then be returned to the Activate Dialog. 3. Wait less than half a minute. You will receive the following message. "Congratulations! You have activated your product to the full version. If you have any problem, please contact us. We aim to reply within one business day. In some computers, it's necessary to Close Edraw program then Restart it again. The easiest option is to give RW right to users on the edraw folder then activate Edraw. Right click the edraw.exe then launch the Edraw. Then click the Register button in the Help menu to activate.